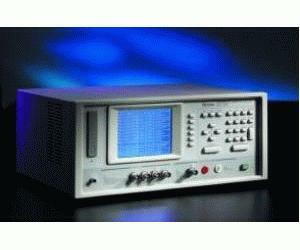 The Chroma 13100 Electrolytic Capacitor Analyzer is a general measurement instrument designed for analyzing the features of electrolytic capacitors. It has multiple functions that can be programmed based on the capacitor features by altering the settings to test metal oxidization thin-film withstand voltage, capacitor leakage current, capacitance, dissipation factor, impedance and equivalent serial resistance, etc. Used with the special designed sequential switch test box A131001, it can complete the test for multiple capacitors or aluminum foil rapidly, accurately and simultaneously in a short time without changing any test wire. The report printing function is capable of printing the test results correctly and completely; and the built-in data calculation function can compute the test data of the product instantly for CPK analysis. To avoid the inefficient calculation process done manually, a test software application is also available for you to create a quality report easily. It meets the EIAJ RC-2364A regulations for electrolytic capacitor test and is a test instrument of choice. Chroma A131001 is a sequential switch test box of ten channels specially designed for Chroma 13100. Each test socket on the test box is implemented with Kelvin measurement, which is suitable for the precise measurement requirement for low impedance and low leakage current. With the SCAN function in 13100 it is able to control the C, D, Q, Z, ESR and LC tests for electrolytic capacitor to be done consecutively without switching the capacitor manually. This increases the test efficiency significantly as it costs only 1/10 of the original test time.